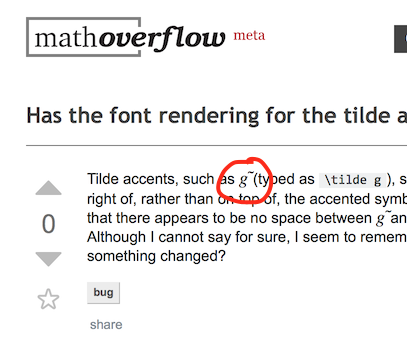 Tilde accents, such as $\tilde g$ (typed as \tilde g), seem to be displaying bizarrely, with the tilde to the right of, rather than on top of, the accented symbol, and with the following kerning messed up (so that there appears to be no space between $\tilde g$ and the following parenthesis above, and just here). Although I cannot say for sure, I seem to remember that this was not always the case. Has something changed? Extra information (thanks to @JonEricson for prompting, to @Glorfindel for reproducing and instructions on how to post the screenshot, and to @DavideCervone for suggesting to check the Math Renderer): I am using Safari 10.1 on macOS 10.12.14, with HTML-CSS as my Math Renderer. Screenshot below. The problem was introduced in the upgrade from Safari 10.0.3 (OSX 10.12.3) to Safari 10.1 (OSX 10.12.4), so I would think it unrelated to the switch in MathJax hosting. It seems to be an issue with the WebKit that Safari uses, but not other browsers. Screenshots directly before and after the Safari upgrade on April 15. This should be fixed in MathJax v2.7.2 that we switched to network-wide earlier today. Not the answer you're looking for? Browse other questions tagged bug status-completed mathjax .